Do you experience temporary addictions to certain foods? The spinach sauerkraut dip pictured above has been my craving for the past week. It all started when Christy brought over a ridiculously good artichoke dip. I couldn’t get enough of it. When all heads were turned, I dug into it with gusto. Later in the week I began dreaming about said dip. Christy said she had used sauerkraut and a little mayo. Driven, to the kitchen I went to create something like it and this is what I came up with. It was so fast. It was so easy. This Spinach Sauerkraut Dip really hit the spot. And it was guilt-free (adjust the mayo to your level of “guilt”). I ate the entire bowl. Place all ingredients into the bowl of a food processor fitted with the "S" blade. Pulse to the texture of pesto. Want it thinner? Add a little of the sauerkraut brine. Alternatively, and what I do, place all ingredients into a narrow and deep jar. 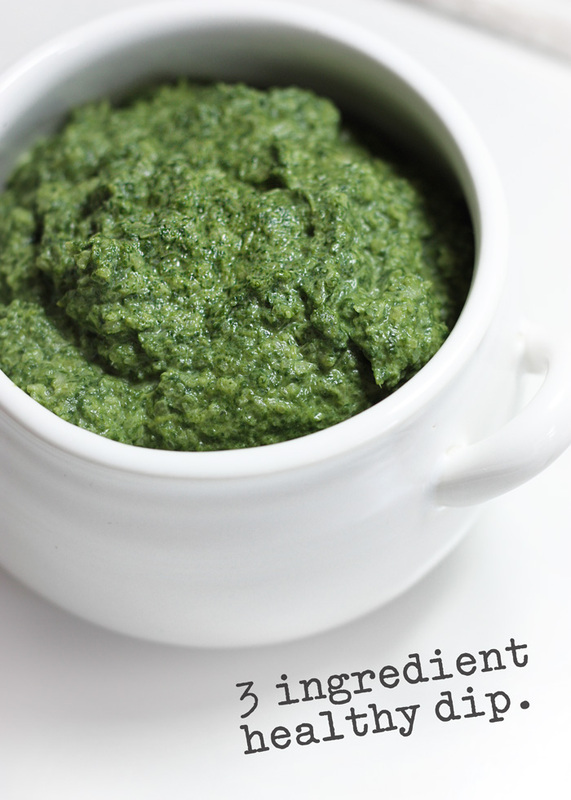 Grab an immersion blender and blend to the texture of pesto. I make my own sauerkraut, and now must try this dip. What did you dip in it? This is a great and simple recipe I would definitely try! Planning to serve this to my family one of these days. I want them to start enjoying vegetables like I do. One question though, could I also use cream cheese instead of Mayo? Thanks! Hi Lexie, Would this work with fresh spinach?